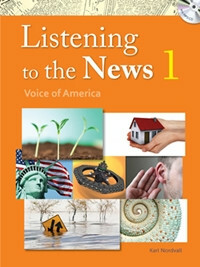 Listening to the News: Voice of America is a three-book series designed to improve listening comprehension skills for academic purposes while providing interesting topics related to culture, news, and current events. Listening to the News 1 contains presentations patterned after news reports from Voice of America, a multimedia broadcasting service funded by the US government. The material for level 2 was derived from VOA Learning English reports, also known as Special English. These news reports draw on a core of 1,500 words, and give students ample opportunity to improve their listening comprehension.